Johannesburg / Herzogenaurach, April 20th, 2010 – Today in Herzogenaurach, Germany, adidas proudly unveils the Official Match Ball for the 2010 FIFA World Cup™ finals match in South Africa. The adidas “JO’BULANI” is a unique gold-colored version of the “JABULANI”, the Official Match Ball of the 2010 FIFA World Cup™. Like the “JABULANI”, the “JO’BULANI” features the iconic South African-inspired design along with the newly developed “Grip’n’Groove” profile, providing the best players in the world with a ball that allows exceptionally stable flight and perfect grip under all conditions. Comprised of only eight, completely new, thermally bonded 3-D panels, which for the first time are spherically molded, the ball is perfectly round and even more accurate than ever before. This is the second time adidas has designed a special ball for a FIFA World Cup™ final, the first final ball was the golden “TEAMGEIST BERLIN”, which was used on July 9th, 2006. The “JO’BULANI” will be available at specialty retailers throughout the US and on shopadidas.com starting April 21st. adidas always involves world-class athletes in the development and testing of its products. 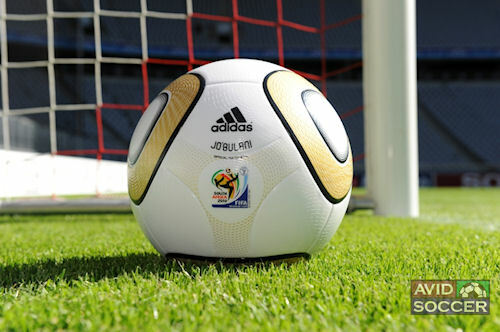 For the adidas “JABULANI”, adidas partners AC Milan, FC Bayern München, the Orlando Pirates and Ajax Cape Town tested the ball in 2008, contributing to improvements in the surface structure and material composition. The involvement of our players continues to help bring the best soccer products to market going forward. adidas continues to use innovative technology to extend its global leadership position in soccer production, thus strengthening its position as the authentic symbol of high-performance sporting goods for professionals and amateurs alike. adidas also will continue to unveil more revolutionary innovations in match ball production for future UEFA, FIFA and CAF competitions. The adidas innovation team (ait) is already working on innovations for the 2014 FIFA World Cup Brazil™. Teams from Argentina, France, Germany, Japan, Mexico, Russia, South Africa and Spain unveiled their new 2010 FIFA World Cup federation kits. The new federation kits will debut on field on Saturday, November 14 and will be worn leading up to and during the 2010 FIFA World Cup. Mexico will debut its new uniform on field in 2010. Players will have option to wear jerseys with TECHFIT Technology Built Into Uniform Offering Individual Choice and Measurable Advantage.